Are you on a journey and want to relax for a short or maybe a little longer time, then you are at the best place to be. 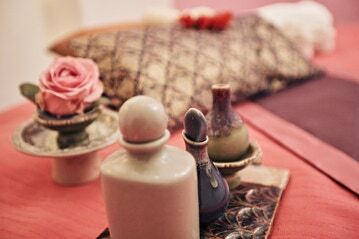 Experience an exotic wellness trip to thailand and recharge your batteries in our beautiful Spa. We ensure that you will love it. Enjoy the tranquility in our Spa. At the beginning, you will receive a floral foot bath with precious and fragrant essences such as jasmine oil and rose petals. Afterwards you will enjoy a peeling of the feet with an organic scrub. After you have experienced this foot sensation, it goes into the quiet oasis, where you choose between a powerful and energizing thai massage or a gentleman and relaxing thai oilmassage. Finally, we would like to pamper you with a very healthy tea or detox drink according to your personal choice.